Arbory Bar & Eatery – Melbourne’s Longest Outdoor Bar! 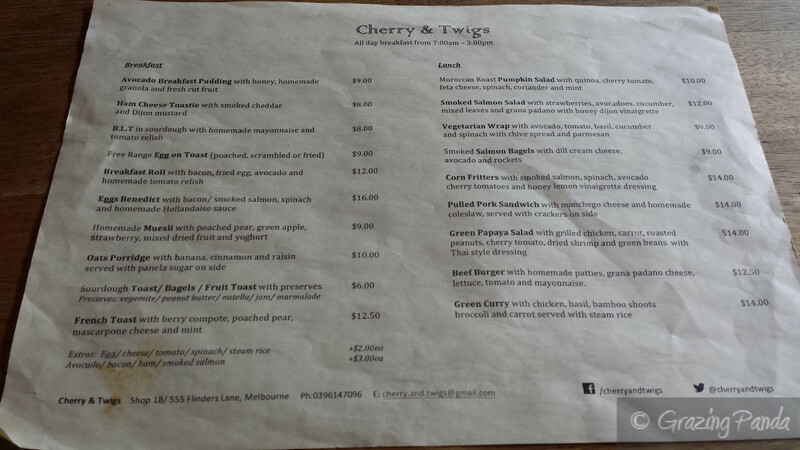 I had heard a lot about Cherry and Twigs and it had been on my list of places to try for a while – eventually I had a chance to actually take a lunch break at work and went to check it out. 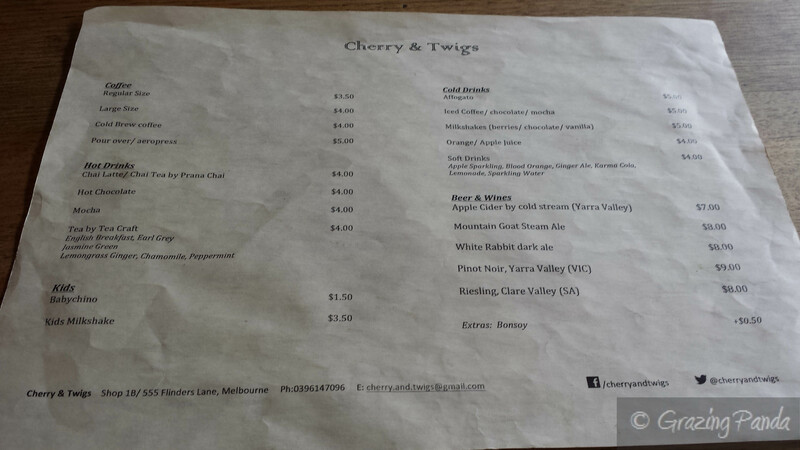 When you look up Cherry and Twigs it gives you a Flinders Lane address (towards the Spencer Street end), however upon arriving at this address I couldn’t find the café and wondered if it had been closed down. But the actual entrance for Cherry and Twigs is hidden in a laneway – called Downie Street (near Holiday Inn)– lookout for the glass to floor folding style doors. The menu compromises of an All Day Breakfast menu as well as a Lunch menu. The All Day Breakfast menu comprises of your usual favourites with a twist – these include Avocado Breakfast Pudding (with honey, homemade granola and fresh cut fruit), Oats Porridge (with banana, cinnamon and raisin served with panela sugar on the side) as well as B.L.T, Breakfast Roll and Eggs Benedict with an option to have it with bacon instead of smoked salmon – just to name a few. The Lunch menu samples a few cuisines such as Moroccan and Thai – consisting of salads, wraps, sandwiches, burgers and a green curry. Coffee here is by Market Lane and The Mailing Room with options such as cold drips and pours overs available as well. Tea is by Tea Craft and there are milkshakes, iced coffee, iced chocolate and the usual soft drinks and juices available. They have their liquor license so beer and wine is also available. I order a chai latte (which comes from Prana Chai) which was perfectly made – with just the right amount of foam on the top. From the very first time I read the menu I knew that I wanted to try out their French Toast – with berry compote, poached pear, mascarpone cheese and mint – so that is exactly what I ordered. The dish comes out with each of the components beautifully plated up. The two pieces of French toast were artfully placed on top of each other with a layer of berries between them; topped with a dollop of mascarpone cream. The poached pear was delightfully fanned out to the right side of the French toast and topped with thin slices of apples and cut up strawberries. Maple syrup was criss-crossed over the whole dish together with shards of fresh mint. The dish as a whole worked really together and I really enjoyed the addition of fresh mint – the flavour enhanced the dish. My only one really tiny qualm would be that the poached pear could have been poached for a bit longer as it wasn’t as soft as I was expecting. Overall I was impressed with the flavours and it really was more than what I was expecting. The staff here are super friendly and always have a smile on their face. Cherry and Twigs is a must visit place be it for good tasting coffee, great tasting dishes or even some delicious dessert treates which are displayed on the front counter. It definitely is worth the trouble finding it! Menu – An All Day Breakfast Menu as well as a Lunch Menu – refer to picture above. Asian street foods are all the rage at the moment and Paperboy Kitchen is a latest addition to the Melbourne CBD. Located on Little Lonsdale Street, between Elizabeth and Queen street is this small sized eatery. Set up by Adam Milgrom – who quit his marketing job and took up training at Leith’s cooking school in London – who started out creating a pop-up version before settling on a more permanent venue in the city. The menu is simple, delicious and fresh. Paperboy serves rice-noodle bowls and bread rolls that come served with Asian slaw, carrot-daikon pickle, Sriracha -Mayo and Coriander. 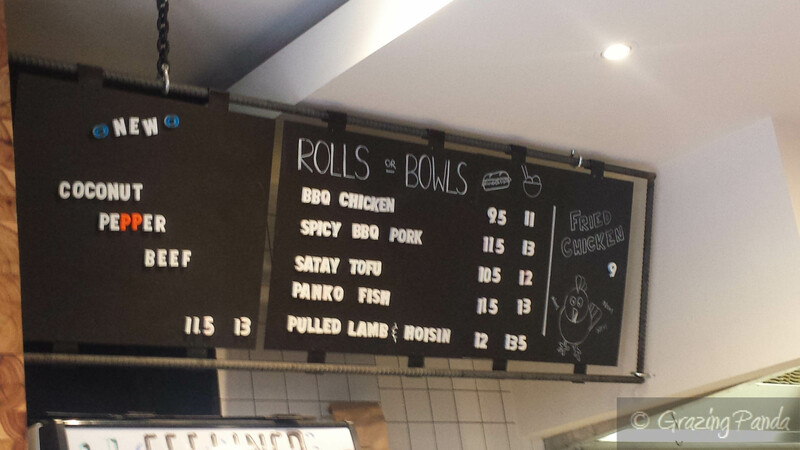 The menu is cleverly named Rolls or Bowls. Once you decide between these two – you then have to choose from a range of fillings which include Coconut Pepper Beef, BBQ Chicken, Satay Tofu, Panko Fish, Spicy BBQ Pork and Pulled Lamb & Hoisin. Both the rolls and bowls come served with a small side bowl of Popcorn topped with chilli spice. If snacks are what you are looking for – Crisp Fried Chicken served with Sriracha Mayo dip is available. If sweets is what you are after – the Milk-Bar Cookie is a must try. Drinks from Charlie’s, Beers and Ciders as well Cola, Lemon Lime & Bitters, Lemonade and Ginger Ale from Phoenix are available, as well as fresh coconuts (that you pick you from the fridge and have them cut up). The coconuts come served with a cocktail umbrella to make you feel as if you are beachside. The fit-out like the menu is simple – complete with wooden high tables and chairs to sit in and enjoy your scrumptious food. There is an industrial combined with an Asian grocer store feel to the venue thanks to the feature of wooden shelves that stored things like Sriracha sauce, soy sauce, water and plants. The main counter from where you order from opens out into the kitchen – which you can peer into and watch as your meals are prepared. As you place your order you are given plastic animals that aid as table numbers which is a fantastic idea. On the tables together with Sriracha Sauce are bottles of chilli labelled “Hot Stuff” – the extra hot stuff for those who dare. I ordered the bowl with Satay Tofu alongside a fresh coconut and a plastic giraffe. The food comes served on a wooden board with the Paperboy stamp on the bottom corner, with the bowl placed in the centre and side bowl of popcorn just above it. The serving size is very generous (I couldn’t finish the entire serving so took it away to have for dinner!) and from the moment it is placed in front of you, the smell of all the ingredients literally take your breath away. The dish is fresh, packs a whole load of flavour and is gobsmackingly delicious. The Sriracha Mayo is the perfect addition of spiciness and tanginess. The Asian Slaw is made from lettuce, cabbage, carrot and black sesame seeds. The Satay Tofu has a crunchy outside which complements the softness on the inside and flavoured to perfection. Together all the components of the dish work seamlessly together to provide a great flavour explosion for the palate. The staff are friendly and always willing to go out of their way to help. Don’t delay the trip to Paperboy anymore! Standout Dish: Any dish really! We (there were four of us) had just visited a friend in the Williamstown area and needed to find a place to have early dinner. After a bit of googling dinner places around the area, we stumbled on Dig A Pony. A quick phone call and we found out that they wouldn’t be open for another 30 minutes, but that would be about the time we would take to drive there. We arrived about 15 minutes before their opening time however since they knew we were coming they saw us hovering around the outside and let us come in early – which was nice of them. 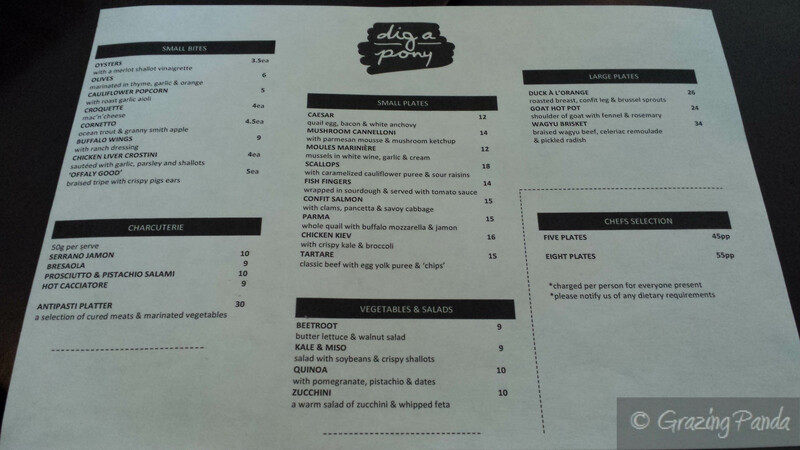 Dig A Pony was opened by owners Mike and Hannah Bacarella in 2009, to create a place that they would enjoy – a place that was welcoming and relaxed to enjoy good food, wine, music with great friends. The name Dig A Pony is inspired by the name of a classic song by The Beatles which was features on their final album “Let It Be” – and was known as a whimsical and eclectic song – which is the vibe that this restaurant and bar is going for. From the outside Dig A Pony looks like your normal corner bluestone pub, but once you step inside you are greeted with wooden tables, creative lamps and lighting along with a variety of seating – from leather lounges to antique chairs as well as bar stools and armchairs – there is bound to be a seating arrangement that you enjoy. During daylight hours the natural light is let in through the many windows, however once night time hits the only lighting is from the light shades and few down lights around the venue – it can get a tad dark. The menu initially was based around Mediterranean Tapas with authentic recipes hailing from Spain, Italy, Greece, Morocco and France – keeping firm the concept of food designed to be shared and enjoyed by all at the table. Enter in Mark Briggs (Vue de Monde, Sharing House) who added his touch of elegance and fine dining background to create an exciting menu that consists of delicious snacks, enticing small dishes as well some spectacular combinations for its larger plates. The concept of sharing, enjoying and having a bit of fun still remains. The menu starts off with eight “Small Bites” – consisting of Oysters, Croquettes (Mac and Cheese) – how awesome do these sound! – just to name a few. Next on the menu are “Small Plates” (you can select from a selection of nine dishes – these include the likes of Mushroom Cannelloni (with Parmesan Mousse & Mushroom Ketchup), Moules Mariniere (Mussels in White Wine, Garlic & Cream), Chicken Kiev (with Crispy Kale & Broccoli), Tartare (Classic Beef with Egg Yolk Puree & ‘Chips’). There is only a selection of three “Larger Plates” to choose from – Duck, Goat or Wagyu Brisket. 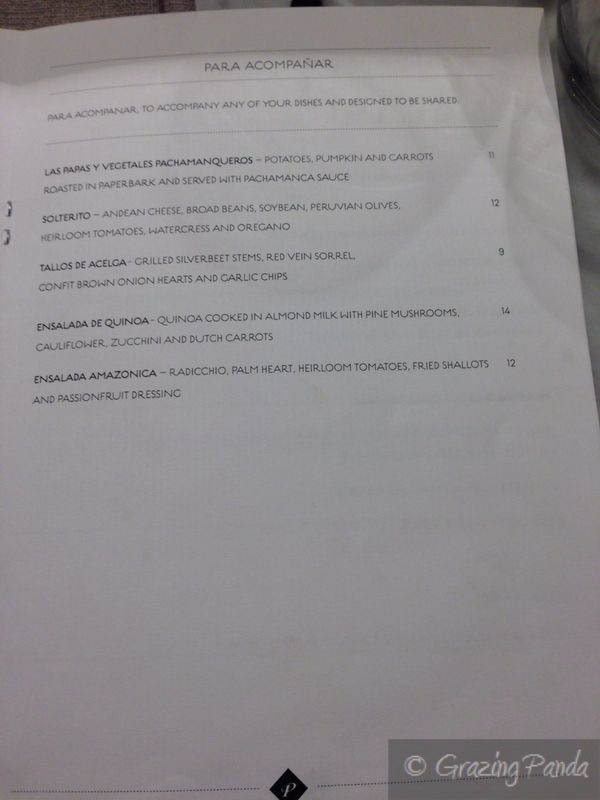 There are “Vegetables and Salads” to choose from as well as a “Charcuterie” section. If you find yourself not wanting to decide dishes on your own there are two Chef’s Selection Menu’s available – Five Plates ($45 per person) or Eight Plates ($55 per person). Their drinks menu is quite extensive – consisting of wines, international and local boutique craft beers, spirits as well as a selection of intriguing cocktails. They also have unique combinations such as beer and whisky for those wanting a drink with a difference. In fact I think if you ask – you can mix just about any drink! I ordered a mocktail – which had flavours of Apple, Mint and Tang – a combination that quite refreshing on the palate. There were two of us who had dietary requirements in the form of Dairy Free and Gluten Free and out waiter was very helpful in identifying which dishes could be consumed to suit. I also thought I would try my luck and ask if any of the meat or chicken was Halal – he found out that the Duck was – so of course we had to order it. There were four of us at dinner so we decided to order a few dishes from each section. We ordered three dishes from the Small Bites section. The first dish was the Cornetto – Ocean Trout & Granny Smith Apple – which came out looking as the menu read – in a cone shape sitting upright on a wire rack. Inside the cornetto cone was the mix of fresh ocean trout mixed with granny smith apple, capers and lime. I loved the mix of the crunchy cone together with the softness of the trout. The trout itself mixed with the apple was a brilliant combination – a hit of flavours for your tastebuds and a must try dish. The next dish we received was the Cauliflower Popcorn with Roast Garlic Aioli – which comes served in a jar with the aioli placed on top. The cauliflower was crumbed and fried to create the popcorn effect and was seasoned well. The roast garlic aioli complimented the cauliflower well and tied the whole dish together. My only comment about the dish is to have the aioli in a separate little dish to make it easier for dipping purposes. The way it was with the aioli on top, when you got towards the middle or near the bottom of the jar you had run out of the aioli. The last dish from the Small Bites section was the Buffalo Wings with Ranch Dressing. I didn’t try this dish; however I did try the Ranch Dressing which was absolutely divine – tangy with a kick of heat of it. Everyone around the table thoroughly enjoyed this dish as well and especially enjoyed the hint of chilli at the end. From the Small Plates menu section we ordered the Confit Salmon with Clams and Savoy Cabbage and Scallops with Caramelized Cauliflower Puree & Sour Raisins. The Confit Salmon usually comes with Pancetta, however we ordered this dish sans Panchetta. The dish was plated beautifully with flavours to match. The salmon had great texture and colouring and was cooked perfectly. The clams for me were the hero of this dish – delectable. Each of the elements brought a different flavour and depth to the dish – from the savoy cabbage laced in dressing to the pumpkin puree and finally the fried onions. A great tasting dish. The Scallop dish was another good dish – the scallops were seared perfectly, the cauliflower puree worked brilliantly with the other elements on the dish and the raisins provided sweetness. After these Small Plates we were onto our Large Plates of which we ordered two. First up was the Goat Hot Pot – Shoulder of Goat with Fennel and Rosemary. I loved the way this dish was presented – in a clay pot with a ring of scalloped potatoes on top. This was a clear favourite around the table – with the goat being melt-in-your-mouth, with the flavours being infused in the right proportions. The next Large Plate dish was the Duck A L’Orange – Roasted Breast, Confit Leg & Brussel Sprouts. The duck was a bit on the tough side when you went into cut into it but the crispy skin on the outside was perfect. The velvety citrus sauce was rich yet subtle and really complemented the duck. This was my first experience of Duck A L’Orange and I must say I did quite enjoy it. We also ordered the Quinoa with Pomegranate, Pistachio & Dates from the Vegetables and Salads section. The elements of tang from the pomegranate and sweetness of the dates, together with the nutty flavours worked well – you really cannot go wrong with this combination. We were all really full from our meals but everyone needed a coffee for the drive home and so we looked at the dessert menu as well. There are five desserts to choose from and I was stuck in choosing between the Violet Crumble and the Parfait. In the end I went with the Parfait of Honey with Chocolate Mousse & Popcorn Granola. This was a really memorable and divine dessert. The chocolate mousse was rich, the parfait was creamy, the popcorn granola was caramelized and if you take each of these components together in one mouthful you will be heaven! If this dessert was this good – I can imagine just how good the other desserts would be! 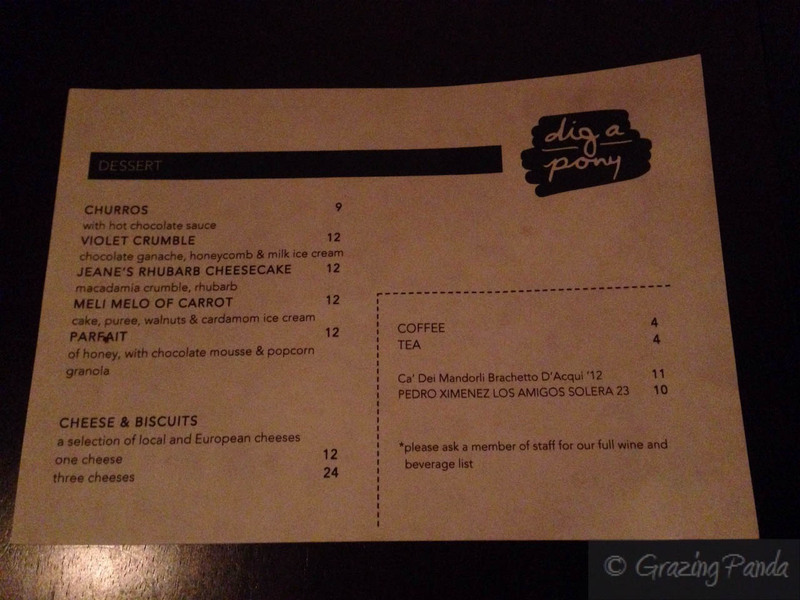 Dig A Pony is the type of place that I wish I had stumbled upon a lot earlier as it serves up some great tasting food using simple ideas and a mix of interesting ingredients. The vibe is relaxed and casual – it’s a great place for a catch-up dinner with friends, as well as for a celebration. Staff are friendly and go out of their way to help in any way they can. If I was you I would definitely make a trip to Yarraville. Atmosphere / Ambience: Relaxed, Casual and Welcoming. Great for any occasion. N and I were in the city on a Saturday night and needed a place for dinner. Looking at my list of places to eat – I found Pastuso which was a newly opened restaurant in the city and we decided to try our luck and see if we could get a table as we hadn’t booked. It was quite early (around 6:30pm) for dinner so we did manage to get a table – and were seated at the marble bench which surrounded the main kitchen. Pastuso is Melbourne’s newest Peruvian grill, cevicheria and pisco bar that comes from the team that opened Argentinian grill – San Telmo – Dave Parker, Michael Parker, Jason and Renee Mc Connell. They are joined at Pastuso by native Peruvian chef Alejandro Saravia (from Sydney’s renowned Morena) and manager Ben Wood. 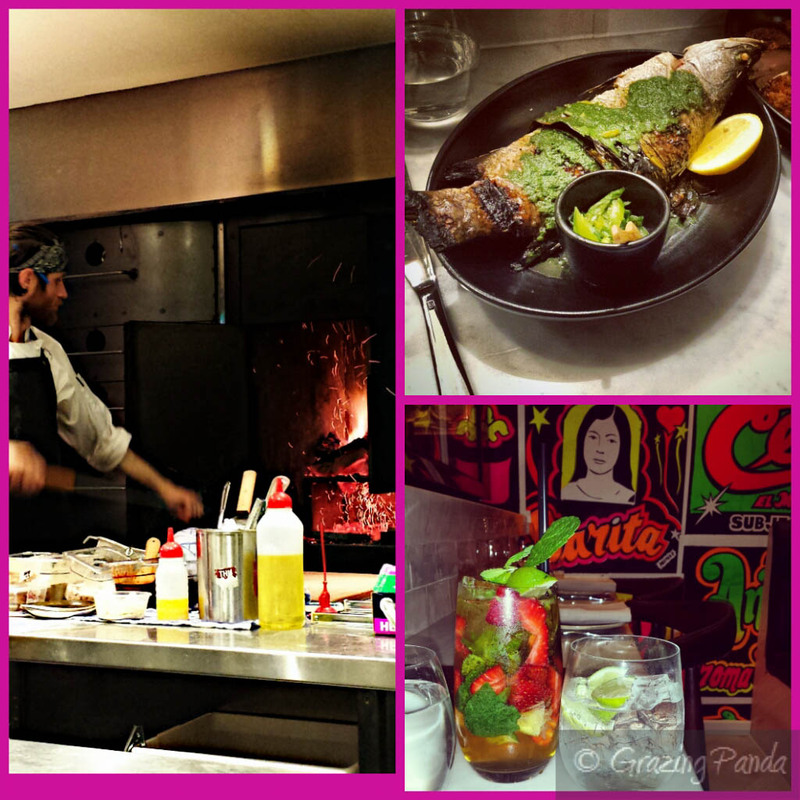 Pastuso is located in the ever cool ACDC Lane and fits in perfectly to this part of town. The space is quite large (I never realised just how big the space was!) and has been fitted out by architects SMLWRLD in collaboration with its owners. The use of space is impressive – there are three bars each servicing different parts of the menu and representing three regions of Peru: the Coast, the Andes and the Amazon Jungle. As you enter you are greeted by the main bar (Amazon Jungle) – sleek and copper topped – which serves a list of Peruvian and Chilean piscos (white-grape brandy Peruvians drink), as well a huge variety of other drinks – cocktails, spirits, beer and wine. Just behind the main bar is the marble topped ceviche bar (the Coast) – where patrons can sit around and watch as chefs marinate and prepare your ceviche right in front of you. To the right of both these bars is the main kitchen bar (the Andes) – which also has marble seating around so that you can sit and enjoy the spectacular action that is the flaming and smoking of the meat and vegetables cooking on the grills and the coal-fired slow cookers – cilindro. Surrounding the three main bar areas are seating on low tables – a mix of marble (near the main kitchen area) and wooden tables (near the ceviche bar) that can seat two, four or more people. There is also a raised area that has huge padded booths. Another definite highlight is the colourful wall of Peruvian chicha (street art) posters that have been shipped directly from Peru. Next to this wall is an impressive glass box which displays various cuts of meat hanging. 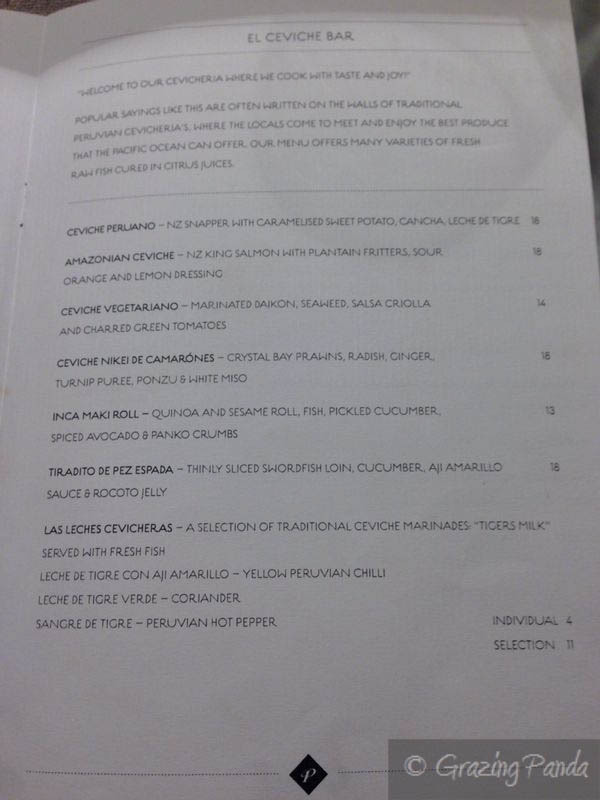 The menu by Saravia boasts a huge variety and takes on the more modern approach rather than traditional. The menu is in the format of a book and starts off with the Un Piquieto, No Mas menu – which means “A Bite to Eat” – and would usually be enjoyed around a table together with friends and family with a good Peruvian Pisco. Dishes include El Choro Chalaco (Mussels), Pezcaditos Y Toastadas (Char Grilled Silver Fish with Corn Bread & Lemon and Rocoto Vinaigrette). The menu then moves onto the El Ceviche Bar menu – which consists of many varieties of fresh raw fish cured in citrus juices – there are seven different choices to choose from. Next on the menu is the La Comida de la Calle – which represents Peruvian street food that you would expect to find on a typical street corner in Lima. Dishes here include Anticuchos (Beef Heart and Swordwish Skewers), Papitas Rellena de Carretilla (Croquettes), Yucas (Cassava Chips) and Nuestra Causa de Pollo (Peruvian Yellow Potato with Chicken, Avocado, Cherry Tomatoes and Aji Mirasol). Para Acompanar is next on the menu list – which are the dishes to accompany your main dishes and are designed to share – in other words sides. You can select from 5 different options including Ensalada de Quinoa (Quinoa cooked in Almond Milk with Pine Mushrooms, Cauliflower, Zucchini and Dutch Carrots), Solterito (Andean Cheese, Broad Beans, Soybean, Peruvian Olives, Heirloom Tomatoes, Watercress and Oregano). Dishes cooked in either the Peruvian Smoking Chamber, Charcoal Grill or Spit lead up the next part of the menu in a section called Los Fuegos Del Peru – meaning to cook with fire. The first two dishes are cooked in the Cilindro Perliano (Peruvian Smoking Chamber) – you have an option of Pierna de Cordero (Slow Cooked Lamb Leg) or Paletilla de Cerdo (Slow Cooked Pork Shoulder) – both served with Peruvian Rice. There are three dishes to select from that come from the Nuestra Parilla (Charcoal Grill) – Pezcado Amazonico (Barramundi in Banana Leaf), Ojo de Bife (Dry Aged Pasture Fed Rib Eye) and Costillas Tiernas de Alpaca (Alpaca Short Ribs). 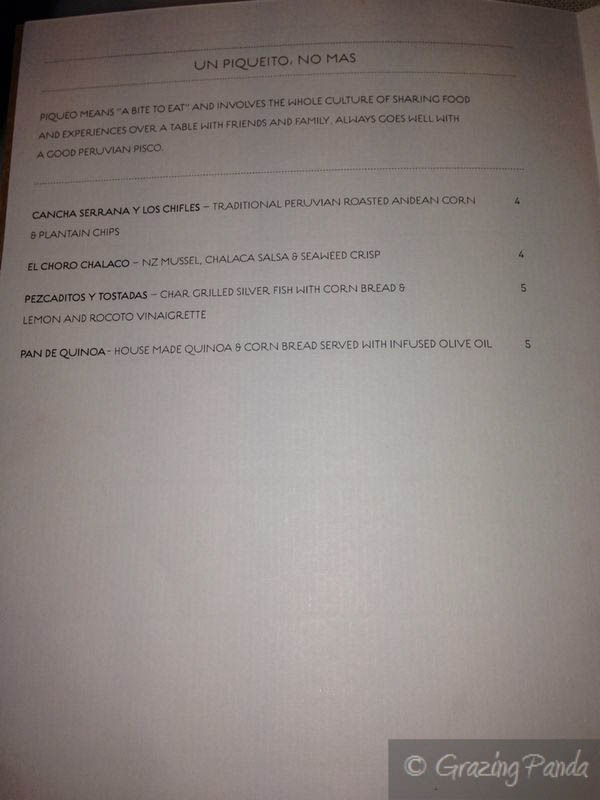 The last dish on this menu comes from the La Braza (Spit) – Pollo a la Braza (Roasted Peruvian Chicken). A menu isn’t complete with a dessert menu and Pastuso’s certainly doesn’t disappoint – called Postre Para Todos – it showcases traditional Peruvian Desserts such as Un Clasico de Mazamorra y Arroz Con Leche (A combination of two traditional classics – Peruvian Style Rice Pudding, Purple Corn Gel, Poached Pineapple and Apples), Picarones (Sweet Potato and Pumpkin Doughnuts). You can also order a Dessert Tasting Plate which allows you to share a selection of desserts. As you can see there was a lot of food to choose from and when reading the description of each dish you really do want to try them all – you almost forget that you can come back another time and try the dishes that you didn’t get to the first time around. I ordered a mocktail which looked amazingly colourful and too good to drink – chunks of fresh strawberries muddled together with mint leaves, lime and citrus to give a refreshingly delicious taste that kept you wanting more. I had to stop myself from drinking it all in the one go. We started off with the Cancha Serrana Y Los Chifles – Traditional Peruvian Roasted Andean Corn and Plantation Chips – which was the perfect way to start our Peruvian journey. The roasted corn kernels were crunchy with a hint of spice that made your tastebuds pop. The Plantation chips were out of this world – simple, textured and crunchy – the flavour was absolutely divine! A must try snack dish – it would work well as a bar snack. For the next round we ordered the La Papa A La Huancaina A Mi Manera – Potato Gnocchi with a Traditional Huancaina Sauce, Botija Olives and Egg White. Huancaína sauce is normally served over boiled potatoes, and then topped with hard boiled eggs and olives – here at Pastuso instead they use potato gnocchi as an alternative – brilliant! The sauce is full of flavour together with a kick of spice thanks to the use of aji Amarillo peppers. If you are lucky enough to sit around the kitchen you can watch as the chefs make this sauce from scratch. The gnocchi was melt in your mouth and coupled with the creamy and spicy at-the-same-time huancaina sauce and slight tang of the botija olives made for one heavenly dish. From the same La Comida de la Calle Menu we also ordered the Papitas Rellena De Carretilla – Street Cart Style Potato Croquettes filled with Pulled Beef Brisket, Pecans, Botija Olives, Watercress and Pickled Onion Salsa. N enjoyed these croquettes – crunchy and golden on the outside coupled with tender beef brisket and cloud like potato filling and finished with a pickled salsa. The only complaint would be that more of the beef brisket be used. For our main dishes I ordered the Pezcado Amazonico – Baby Cone Bay Barramundi Grilled in Banana Leaf with Fresh Herbs and Amazonico Rub from the Nuestra Parilla (Charcoal Grill). The presentation of this dish is simple – yet visually stunning. The whole baby barramundi is laid across the black backdrop of the plate (fish eye, tail and all) topped with the vibrant green Amazonico rub. In a separate small bowl there are some fresh sautéed vegetables with a lemon wedge off to the side. The barramundi is cooked perfectly and results in soft white fleshy morsels. The rub is delicious and flavoursome and is very much needed, as the fish on its own is very lightly flavoured. One for the fish and seafood lovers. 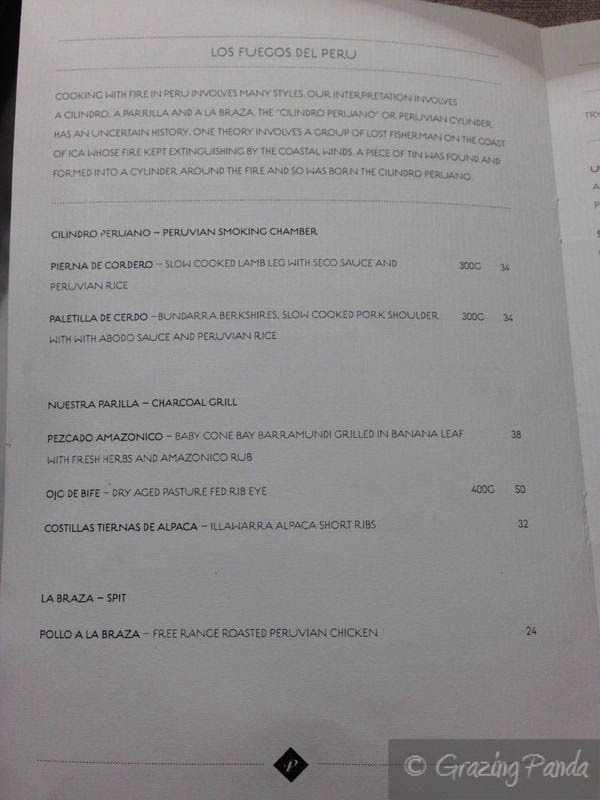 N ordered the La Braza – Pollo A La Braza – Free Range Roasted Peruvian Chicken from the La Braza (Spit) for his main. Once again – very simple plating techniques was used – to showcase the hero of the dish – the Peruvican chicken. A simple green dressing was provided in a separate bowl for additional flavour. The chicken has been slow-cooked after a lengthy marination period (think cumin, soy sauce, red wine vinegar, coriander, Sichuan pepper) and is moist and flavoured with pepper, spices and a kick of heat. We also ordered Tallos de Acelga – Grilled Silverbeet Stems, Red Vein Sorrel, Confit Brown Onion Hearts and Garlic Chips. This dish was another standout – simple yet the flavours worked amazingly well together finished with the crunchiness of the garlic. The confit brown onion not only complemented but brought the whole dish together. If you enjoy a good salad this is one to try. As full as we were the night wouldn’t have been complete without ending on a sweet Peruvian note. We ordered the Tres Leches – Traditional Latin American Sponge Cake soaked in Three Kinds of Milk served with Roasted Pineapple Ice Cream. The cake had a distinct texture (you would expect it to have a somewhat soggy consistency after being soaked in three types of milk) with a result of being light, moist and rich yet delicate (the flavour of 3 types of milk wasn’t over powering at all!). The roasted pineapple ice cream was delicious and the fresh pieces of pineapple embedded within the ice cream were refreshing. Pastuso has such a lively and warm atmosphere. The open plan of the kitchen and ceviche bar is such a fantastic idea in this day as people like to watch how chefs prepare and create such great tasting dishes – especially here where you can see chefs as they delve into the fire chamber and have embers flow out – it all adds to the experience of the place. The staff are very friendly, always happy and knowledgeable – they can also assist you when ordering to ensure you do not over order. Want a truly memorable Peruvian experience – get down to Pastuso now! Atmosphere / Ambience: Lively, Fun, Warm and Inviting – such a great place for a celebration or a catchup – or even date night! Standout Dish: Too many to name! Brothl – Cheeky & Healthy! Brothl has taken over where Silo by Joost left off. It is small cafe located in Hardware Lane by passionate eco-entrepreneur, enthusiast and sustainable design champion, Joost Bakker. The idea behind Brothl came about from Bakker, who was a florist and designer, and supplied flowers to Neil Perry’s Rockpool and saw the wastage that occurred in the form of bones from the meats and seafood that was being used. He then asked Perry if he could take these bones and Perry was more than happy to oblige. The same context of using “the stuff other people throw out” that was behind Silo is being rehashed here at Brothl – and it works thanks to Bakker and his team, which includes chef Ryan Bussey. Brothl centres around the creation of four different nutritional and delicious broths that take these unused bones – taken from high end Melbourne restaurants such as Rockpool , Attica and The European – and is slowly stewed for an optimum period of time. Broths are all made with rainwater from Monbulk and include a 48-hour stock from the bones of Rockpool’s Cape Grim beef; a chicken stock simmered for 24 hours; and a 12-hour seafood version from fish and different crustaceans, including marron and crab. There is also a vegetarian option with stock being made from kelp foraged from the Bellarine Peninsula and simmered for 8 hours. There is an organic breakfast broth available as well – made with fruit skins, seeds and cores and is served with oats, seasonal fruit, nuts and optional Schulz milk. The way in which Brothl works is that you first select the type of broth you want – beef, chicken, seafood or veggie – to act as your base (this will cost you $10). You then can choose from 18 different add-ons such as house-made spelt or soba noodles, foraged kelp, beef brisket, poached chicken or mussels, seasonal vegetables, hard or soft egg, kimchi and bacon or even chicken feet! These additions will cost you between $1 – $8. Each broth option also comes with a Chef’s Recommendation – which is what the chef recommends you should add-on to the broth – that you could opt for if the choices are too hard for you to make. 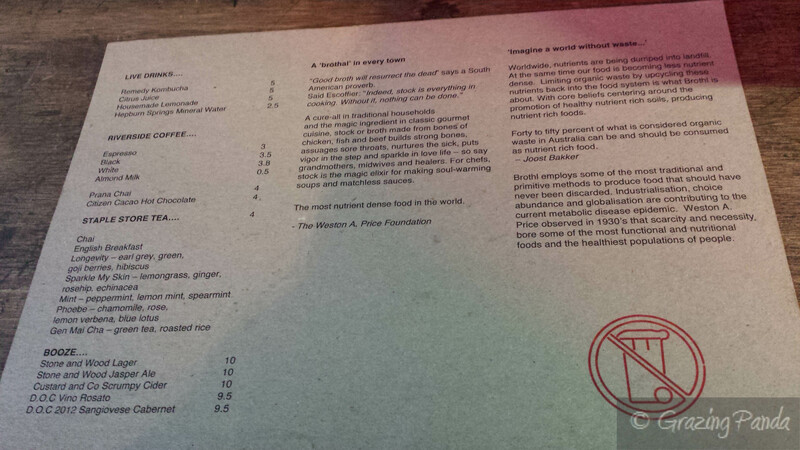 The menu also informs you of what vitamins, nutrients and minerals each broth will bring you. 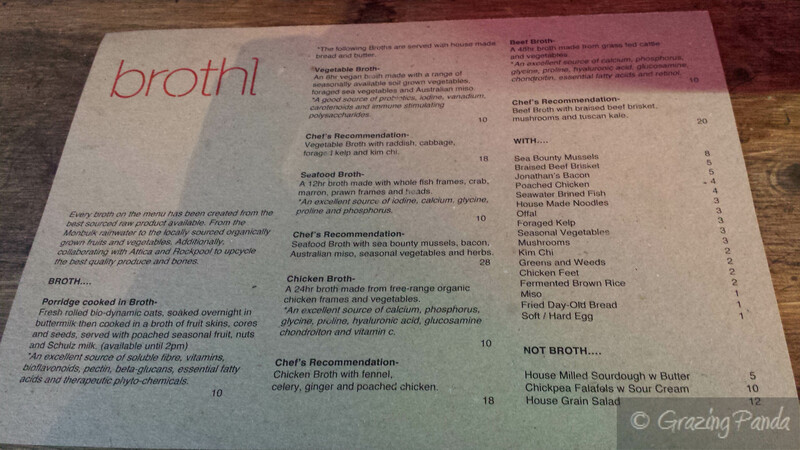 There are also some “Not Broth” options such as the Chickpea Falafels and House Grain Salad. 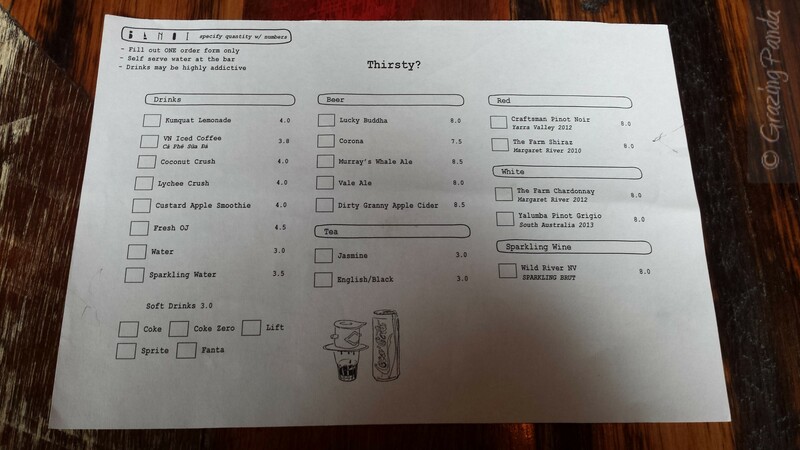 The drinks menu includes a list of “Live Drinks” – Remedy Kombucha (good for your liver), Citrus Juice, House made Lemonade. Coffee is from Riverside Coffee and they also serve Almond Milk if that is your preference, along with Staple Store Teas (Sparkle My Skin, Phoebe, Gen Mai Cha, Longevity). There are also a small selection of Beers, Ciders and Wines available. As you step into the store you are greeted by a large neon sign with the café name, located at the front counter. This counter also houses some delicious sweet treats and desserts – some of which are gluten-free. Brothl is fitted out with entirely recycled or recyclable material – from the hand-cut flowers from Bakker’s garden itself, communal dining table to the crates that line the ceiling, as well as the all-natural paint and stools made from irrigation pipes and leather offcuts (these stools are a tad bit uncomfortable to sit on, however are quite funky !) The coffee machine has clear side panels which allow you to look at the machinery behind making a coffee which I think is brilliant. The result is an unique, funky and cosy little cafe – where you can watch as the chefs prepare your food as the kitchen and the dining area are pretty much as one. I visited Brothl during my lunch break – around 1pm – and it was very packed, however I managed to grab a seat near the front counter. For my base broth I was deciding between the seafood option and the vegetarian option and ended up choosing the seafood option. For my add-ons I went with Mushrooms, Seasonal Vegetables and House made Soba Noodles. The broth comes served with House made bread and butter. Whilst I waited for my broth – I ordered a Latte and opted to have Almond Milk. The latte was delicious and I loved the difference in taste due to the use of almond milk. I am quite the fan! The broth is served in terracotta pots which have been coated in white on the inside, with the bread and butter (served in a separate dish) all on a round serving tray/dish. From the moment it arrives, you can smell the seafood in the air – it is strong and takes you to the shores of a beach. The broth has a rich depth and is quite tasty – the seafood flavours were evident from the start to end of your slurp, however for me the overpowering smell got to me and I couldn’t finish my entire bowl. The add-ons were fresh and worked well with the flavouring of the soup. I think next time I will opt for the vegetable broth and see how I go. The bread and butter were a great addition as it helped to soak up the broth and add another level of depth, texture (bread) and saltiness (butter) to the meal. Brothl really does achieve its main goal of seeing more organic waste consumed as nutrient-rich food. It is a healthy and fun option that you can’t get anywhere else in the Melbourne CBD. Brothl is open for breakfast (from 10am), lunch and dinner – so head down and check it out. Atmosphere / Ambience: Casual, Funky and Relaxed. Great for a lunchtime health boost! I have previously heard about Third Wave café and their strong focus on American BBQ flavours on both meats and fish, so I was delighted when owner Greg invited me to come and experience this first hand at the Prahran Third Wave. One small hiccup when we arrived was that our reservation hadn’t been placed – luckily a table was available and we were shown our seats. Third Wave is owned by husband and wife team – Greg and Inga and there are currently two locations – Port Melbourne and Prahran. The café in Prahran is the sister café to their first café / restaurant in Port Melbourne. Both venues hold true to their tag lines – “Café by day, American BBQ restaurant by night” – with the Prahran venue also having a specialised Paleo Menu. The Third Wave at Prahran focuses mainly on breakfast/brunch/lunch but from Wednesday to Saturday they open their doors at dinner time for patrons to enjoy the American BBQ experience. The fit-out is simple – softly lit with a dark wooden decked ceiling pairs well with the dark wooden tables with curved white chairs – there is also some banquet seating available. The main attraction is the big marble topped bar / coffee counter – with the kitchen located behind. Their homemade sauces and fresh flowers line this bar for added colour and pop. The vibe is welcoming, bright and has a homely feel to it. Another thing to note is that Third Wave is not just about the American BBQ flavours – they are serious about their coffee as well. They use 5 Senses coffee and even have syphon coffee available. Third Wave has revamped its menu after working tirelessly for many months – on “secret recipes”, as well experimenting with different cuts and cooking times. The idea is also to source some of the best hickory, maple and apple wood in order to impart distinctive flavours into the respective meat and fish dishes as well as using traditional dry rubs and barbecue sauces. The team has now perfected the art of barbequeing. The new menu has a strong focus on a range of slow cooked meats and fish that can be accompanied with homemade sauces and a selection of side dishes. The menu is split into different sections – starting off with the Slow Smoked BBQ, “More”, Sides, Paleo Menu and ending with Sweets menu. 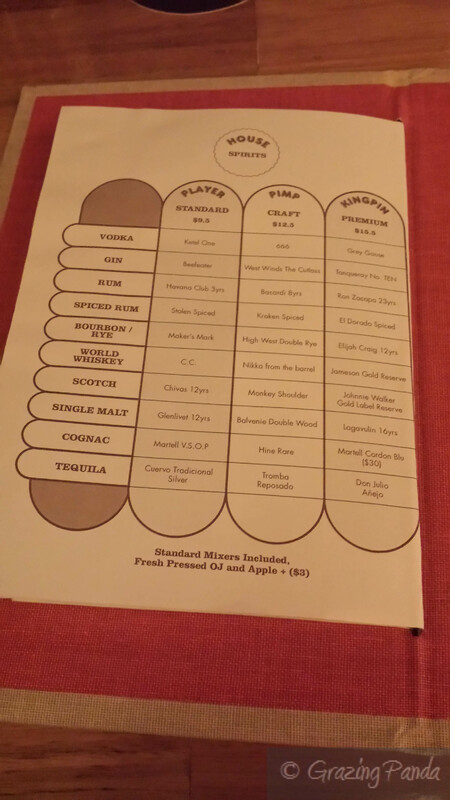 The Drinks menu includes Beers, Ciders, Spirits, and Cocktails such as an Espresso Martini, Uptown Apple Cider and Pomegranate Cosmo. Sangrias are also available and served in a 500ml carafe. Other cold drinks that are available include the usual soft drinks, as well as juices (Pomegranate Juice, Blueberry Juice), Smoothies (Spirulina Smoothie, Mango Smoothie), Iced Drinks – such as Ice Coffee, Ice Chocolate and Ice Mocha. The Slow Smoked BBQ includes the 6 main meats and fish (Salmon) such as Beef, Chicken, Lamb Shoulder, Pork and Beef Brisket which come in medium/half rack (recommended for 1 person) and large/full rack servings (to be shared by 2). All the meats and fish have been marinated for over 8 hours and the smoked using either apple, hickory or maple wood. They all come served with BBQ Sauces which are made in-house. The “More” menu consists of dishes that are big enough to be considered mains if a Slow Smoked BBQ isn’t what you are up for and include dishes such as Gourmet Burger, two different Salads, Lamb Quesadilla, Crusty Salmon. There are around 8 dishes to select from the Paleo Menu which include Almond Crusted Chicken, Zucchini Fritters, Lamb Shakshuka just to name a few. There are a number of Sides that can be ordered as well and most of these can be made into either Vegan/Vegetarian options. These include the Smoked Mac Cheese, Crispy Coleslaw, Glazed Mushrooms, Confit Kipfler Potatoes and a variety of salads. N and I decide to dive straight into the Slow Smoked BBQ Section – N opting for the Beef Ribs and I went for the Salmon. We also ordered a side of Confit Kipfler Potatoes, Smoked Mac & Cheese and a Georgian Salad. For drinks I ordered a Pomegranate Juice – which came bottled and was actually 100% Pomegranate juice which I was impressed about. I am a huge fan of Pomegranates, so whenever I see it available on a menu I always order it – this was a massive tick in the box for me. The Beef Ribs have been smoked using a special 9 spice dry rub and smoked with hickory wood. You can select either a half rack or a full rack – N opted for the half rack. The Beef Ribs come served with their homemade Spicy IQ BBQ sauce as well as a Horseradish sauce. N enjoyed thoroughly enjoyed his dish – the beef he said was tender, succulent and slid off the bone so easily. Further, the sauces were a great addition to the smoky flavours – with the IQ BBQ adding some spice and the horseradish bringing some creamy tang. I ordered the Salmon which has been brined in salt, sugar and spices for 8 hours followed by being smoked over Apple wood to elicit a beautiful smoky spicy flavour combination. This flavouring really does complement the rich flavour of the salmon. The salmon itself was soft, moist and perfectly cooked and comes served with a homemade dill sauce. A wedge of lemon was also provided for extra flavouring which I didn’t think was needed. The addition of the dill sauce added a creamy, somewhat spicy tang which meshed well with the salmon. Overall a really great tasting dish. We also ordered the Confit Kipfler potatoes which were dusted in rosemary. The potatoes were well cooked and had a beautiful crunchy casing with a soft, pillow like centre. They served as a great accompaniment for the Smoked BBQ dishes. The Smoked Mac & Cheese is their take on the classic Mac & Cheese – with an added twist. Third Wave’s version is smoked with Hickory wood. The result is brilliant smoky flavours intertwined with the cheesy flavour. Anyone who is a fan of the traditional Mac & Cheese will definitely want to try out this version. The Georgian Salad was a mixture of 5 herbs – parsley, coriander, dill, mint and basil – together with tomatoes, cucumber and red onions and dressed with red wine vinegar and olive oil. The flavours were refreshing and punchy and worked well with the combination of the other dishes we ordered. This dish came recommended by our friendly waiter. No meal is complete without dessert (even if you are really full!) so after much deliberation and some help from our waiter we ordered the Pecan Pie. I was tossing up between the Creamy Orange French Toast – which was concoction between a fluffy bread and butter pudding and a moist French Toast – will have to come back and get that next time around. The Pecan Pie is served warm with Espresso Cream and Vanilla Ice Cream. I love the combination of a warm pie that literally melted in your mouth together with the coldness of the espresso cream and ice cream. The added texture thanks to the crunch of the pecans was an added bonus. The highlight for me was the espresso cream – with just the right flavouring of coffee. Third Wave has an extensive menu complete with Russian inspired dishes and the hugely popular and great tasting American BBQ. I have also heard and read great reviews about their breakfast offerings (I must come back and try!). They also make homemade sauces such as Hot Bar-B-Que Nectar and Sweet Apple Bourbon sauce which you can in store. If you are looking for delicious food that you can’t find anywhere else in Melbourne – check out Third Wave! Atmosphere / Ambience: Casual, Homely and Welcoming. Great for a catchup dinner with friends. Kong BBQ – Worth All The Hype! There was so much hype surrounding the opening of Kong in Richmond, especially after the trial run of some of the food you could eat at the Rue & Co branch. The branding is all about the Pandas – and as per my blog name – anything to do with Pandas and I am in! A bunch of us (there were 6 of us) decided to try it out on a Tuesday night and aimed to get there around 6pm. I had heard about the long queues – with the wait time being over an hour! Kong doesn’t take bookings, however if you arrive at the restaurant you can put your name down for a table and they will contact you when a table comes up. Kong is the latest addition to The Lucas Group. Chris Lucas has brought us the likes of Chin Chin (Melbourne CBD) and Baby (Richmond – and just up the road from where Kong is located). Kong is located on the site of what was once Pearl, and Eades & Bergman have been brought in to help with this transformation. Kong seats 60 people – with a mixture of single low tables, long communal tables and seating all around the bar / kitchen, as well as in the corridor as you walk into the restaurant. These seats give you a vantage point to see your dishes being prepared. The tables are blonde wood, the look industrial mixed together with an anime vibe thanks to the array of pandas around the venue. There are the signature neon signs (these can be found in all their other venues) as well as a film being projected. During the day you can imagine fresh sunlight streaming in from its floor to ceiling windows which surround the restaurant this corner site restaurant. The Executive Chef here is Benjamin Cooper together with Dan Briggs and all the chefs here at Kong wear red baseball caps which have three letter slogans on them – either KIM, CHI or BBQ – a nice touch that further adds character to Kong. The idea behind Kong is to combine barbeque pit cooking techniques with Japanese and Korean flavours. The focus is on seafood and meat being cooked on either an open-flamed charcoal grill or in a smoke oven. If you get seating around the kitchen you can experience the smoke rising from the pit ovens which is a visual spectacle that will have your taste buds dancing being tantalized in anticipation of the meats/seafood to come. It is also good to note that Kong uses only chemical free charcoal and sustainable Australian Hard-Wood. The menu is split into 8 different sections – Small, Ssam Roti-Roll, Buns, Wings, Natural Fire, Ribs, Rice & Green and Desserts. Small dishes include Wood Grilled Scallops, Trio of Kimchi & Pickles, Beef Tartare and Nasu Miso just to name a few. The Ssam Roti-Roll have fillings such as Teriyaki Roast Ora King Salmon, BBQ Chicken, Grilled Miso Marinated Tofu and Pulled Pork. Smoked Brisket, Spicy Pork Belly, Soft Shell Crab and Peanut Butter Salt & Pepper Tofu are the options you have to choose from in the Bun Section. There are four variations of Wings that you can order from – Honey, Garlic & Sesame Korean Wings, Hot Wings with Gochujang and Chipotle, Soy Wings or Peanut Butter Wings. Natural Fire are from the BBQ Pit and cover most seafood and meat options. There is also a Kong Bossam BBQ Tray – Chicken, Pork, Pork Belly and Beef Brisket served with Lettuce, Pickles, Kimchi and Walnut Ssamjang – at a bargain price of $28 a tray. Rice & Greens include two different types of Fried Rice, Dukkbokki Rice Cakes, Spicy Cabbage Slaw, Wood Roasted Pumpkin etc. Desserts have a smaller selection – only 4 to choose from but they all sound quite delicious so the number doesn’t really matter. I arrived before the other girls around 6:15pm and as there were going to be six of us (as everyone had to be there before we could have a table), I put my name down on the list and the wait even at that time was going to be around 45mins. Since I had been fasting all day I wanted to order something small whilst I was waiting for the others to arrive. I was seated along the wall on the high benches and decided on the BBQ Corn with Chilli Salt and Miso Butter. It wans’t just because I was really hungry but this corn was deliciously amazing! The corn had been bbq’d perfectly and emit just the right amount of smoky flavours. The corn itself was juicy and “crunchy” and the combination of the miso butter and chilli salt was the icing on the corn so to speak – it added an additional salty and spicy hit to combine with the sweetness of the corn. Whilst waiting for the girls to arrive and for our table to be ready we were able to order drinks – I ordered the Lychee & Grapefruit Crush with Coconut Water. This drink came out in a glass jar topped with ice and pieces of fresh grapefruit and was not only thirst quenching but refreshing as well. I had to stop myself from drinking it all in one sip! Once we were seated we had the mammoth task of deciding what dishes we wanted to order. We had a mix of vegetarians and a pescatarian (me! ), as well as people that could eat everything. We picked dishes that we would work to cater to everyones needs and asked our friendly waiter if the amount of food we ordered was enough. He was happy to assist and told us that if we wanted anymore dishes we could just order as we went. We started off with the Wood Grilled Edamame with Chilli and Sea Salt. The Edamame was fresh and had somewhat of a smoky flavour coming from the wood grill with a hint of spice. A tasty dish. Next up we ordered the famous Ssam Roti Rolls – we got a serving each to suit the three categories of requirements – Ssam Roti Roll – BBQ Chicken with Lemon, Gochujang and KimChi, Ssam Roti Roll – Grilled Miso Marinated Tofu with Pickled Cabbage and Kewpie Mayo and Ssam Roti Roll – Teriyaki Roast Ora King Salmon, Wok Fried Broccoli and Tomato. I tasted the Ssam Roti Roll with the Roast Ora King Salmon which was superb! The roti on the outside was divine – thin, crispy and buttery – the perfect casing. The filling was rich and full of flavours with the broccoli, tomato and the spicy, creamy sauce working seamlessly with the perfectly cooked salmon. I would definitely recommend this dish. I did also sample the Ssam Roti Toll with Tofu which was another flavoursome dish, but my pick would definitely be for the King Salmon. Some of the other girls ordered the Wings – Korean Fried Wings with Honey, Garlic and Sesame, however upon eating this they found the chicken overly sweet and couldn’t eat the dish. They knew the dish would have a sweet tone to it – after all it did contain honey; however they weren’t expecting the sweetness to be so overpowering. They mentioned this to our waiter who was happy to replace the wings with another serving in a different flavour. They then ordered the Wings – Hot Wings with Gochujang and Chipotle. They really enjoyed this dish which had a real kick of spice and a peppery taste. I also ordered a serving of the Soft Shell Crab with Salted Duck Egg Relish and Coriander. The bao bun was soft and as you bit into it felt like you were eating clouds. This combined with the crunch of the crab paired with the amazing creamy duck egg relish was a match made in heaven! The coriander added freshness to the whole dish. You could just keep eating these buns and not get sick of them. A few of the girls ordered the Wood Grilled Scallops with Tobanjan and Mirin Pickled Radish – which comes served in a shell and topped with micro herbs and radish. They loved the flavours and really enjoyed the scallops – which were cooked to the right consistency. We ordered the Dukkbokki Rice Cakes with Red Chilli, Gochujang and Roasted Parsnip which was quite the colourful dish when it came out. Amid a dark blue backdrop of the dish – the rice cakes were a vibrant burnt orange colour peppered with greens and reds. I have never seen rice cakes in this form before and was intrigued to see how it tasted. The cakes were rectangular in shape and were soft to eat – with the dish having a sweet and sour flavour to it. I loved the addition of the veggies and the chilli which worked well with the texture and flavouring of the dish as a whole. We couldn’t leave Kong without trying something from the Natural Fire section and ordered the Wood Roasted Salmon with Crispy Skin, Seaweed Salad and KimChi. The dish was beautifully presented with the Crispy Skin standing tall next to the Roasted Salmon. Instead of the seaweed salad we had a broccoli salad mix – which I found to be quite fresh and tasty. The wood roasted Salmon was another good dish – the smoky flavours immersed with the natural flavours of the salmon. We were all keen to try the Kimchi at Kong – after all Kimchi is a signature Korean dish! And the fact that Kong has signs relating to this dish – “It’s not ordinary cabbage, it’s fermented cabbage” almost egged us on to try the dish out. The Kimchi was spicy, tangy and flavoursome and went above and beyond all of our expectations. Yum! The last dish that we ordered was the Fried Rice with Spicy Enoki Mushroom and Soy Charred Tofu. I was surprised to see pumpkin seeds on top when it came out. The dish was fresh, spicy and delicious. I loved the combination of tofu and mushrooms in the rice. The dessert offerings when compared with the rest of the menu are minimal but the quality and taste that they come in make up for this fact. We ordered the Coconut Sago with Passionfruit and Pineapple Trifle and the Apple and Walnut Tart with Miso Butterscotch and Japanese Whisky Ice Cream. Both dishes are impeccably presented with flavours to match. The Trifle comes served in a clear glass – showcasing the many layers of the trifle. The trick with these desserts is to get a taste of each layer in one mouthful. The finely cut pieces of pineapple makes up the base layer, with the passionfruit compote with passionfruit seeds being the next layer, and finished with the coconut sago. This dessert was a light and refreshing dessert packed with fruity flavours and textures. A definite fave of mine. The girls enjoyed the apple and walnut tart – which came out presented with a large ball of Japanese Whisky Ice Cream on placed on top amidst the array of walnuts. They said there was only a slight taste to the whisky ice cream but was delicious nonetheless. The pastry that encased the tender apples was buttery and soft, with the added crunch of the walnut crumble. There was a sweet caramel taste mixed with the creaminess of the ice cream. What needs to be mentioned is the staffing – they are friendly and helpful and despite the lines going out the door they do not come across as flustered at all. They keep an calm demeanour and go above and beyond expectations to make you feel at home even if you are waiting upwards of an hour. Another reason why this place is doing so well. Kong is brilliant addition to the wonderful world of dining that exists in Melbourne – with offerings of an interesting menu complete with fresh flavours, smoky excitement and spiciness. Meat lovers will adore this place (especially the BBQ Tray) but really anyone will love it. What’s not to love about a friendly and warm welcome, together with cute pandas, a great fit-out and an enthusiastic vibe? NOTE: Kong now offers Takeaway – which can be ordered online for pickup. 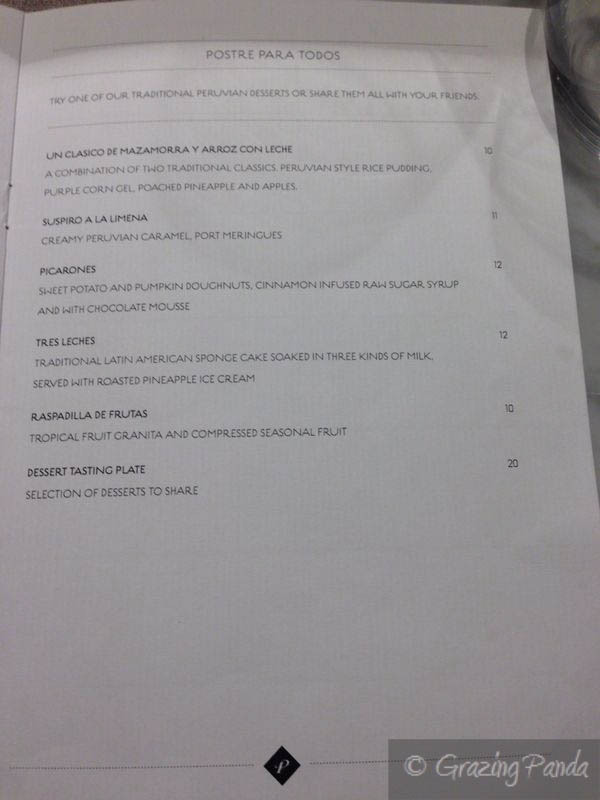 Menu – Refer to Picture above. You can find the Takeaway menu at http://www.kongbbq.com.au/takeaway which will give you an idea of what the main menu has to offer. Atmosphere / Ambience: Funky, Vibrant and Fun-Filled. Great for a catchup with friends and family. Service: Fantastic – really friendly and helpful! They really do well for a place that is packed to brim majority of the time. Online Booking: No – Kong is a walk-in only restaurant. If you work around the Docklands vicinity you would have noticed the recent influx of Vietnamese food ventures opening up. Banoi is one of these Vietnamese venues that have opened up in this area and is located opposite the brightly coloured NAB building on Bourke Street. Banoi is owned by a Vietnamese team and is all about offering a contemporary dining experience all whilst staying true to the Vietnamese heritage and culture, using quality local fresh Melbourne produce. The fit out is fantastic – modern yet vintage with touches which are reminiscent of the Saigon markets back in Vietnam. There are timber feature walls, vibrant use of colours, detailed light fittings with filament light bulbs, hand painted works and imported tiles in the bar and coffee area. There are timber tables inside – both communal and individual tables – some with stools fixed with bicycle pedals (how awesome!) – as well as seating outside. The tables are set up like any other Vietnamese restaurant whereby there is easy access to cutlery and condiments. 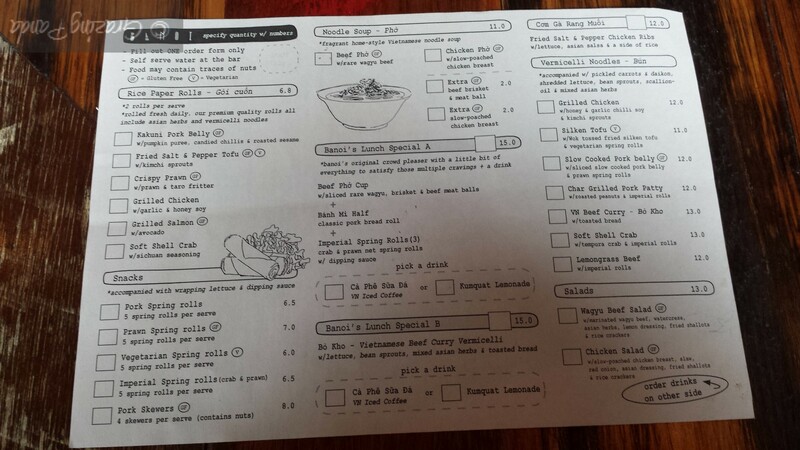 The food menu is set out like a lunch order menu where you place the number in the box alongside the item that you want. The Menu is broken up into a number of sections – Rice Paper Rolls (there are 6 to select from), Snacks (consisting of spring rolls mostly and one skewer dish), Noodle Soup (Pho – either beef or chicken), Banoi’s Lunch Special – there are two that you can choose from A or B, Vermicelli Noodles (there are seven different flavours to choose from) and Salads (either a Wagyu Beef Salad or Chicken Salad). 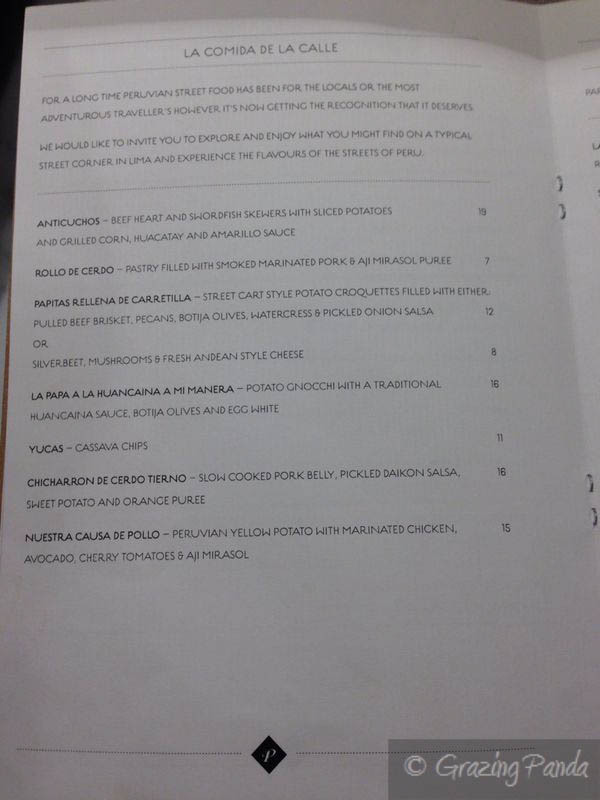 The menu also highlights which dishes are Vegetarian and Gluten-Free. At just $15 the Banoi’s Lunch Special are a smashing deal and great value for money. Lunch Special A consists of a Beef Pho Cup, Banh Mi Half together with Imperial Spring Rolls of which you get 3. You can also select a drink of either a Vietnamese Iced Coffee or Kumquat Lemonade. Lunch Special B consists of Vietnamese Beef Curry Vermicelli with your selection of a drink as above. The drinks menu is quite extensive and consists of a selection of drinks such as Kumquat Lemonade, Vietnamese Ice Coffee, Coconut Crush, Lychee Crush, Custard Apple Smoothies etc. There is also a selection of beers and wines, as well as the usual soft drinks and tea. Banoi gets really busy during lunch times and I would suggest getting there at 12pm sharp in order to get yourself a table. They do take bookings but only if the booking is for 12pm, as they want to cater for walk-ins after that time. For those on the go there is a separate line / window where you can order rice paper rolls and drinks to take away. The first time I tried Banoi I used this take away line and tried out two different types of rice paper rolls. I ordered the Fried Salt & Pepper Tofu with Kim Chi Sprouts as well as the Grilled Salmon with Avocado. Each serving comes with 2 rolls per serve. You also get your choice of sauces. The rolls were delicious and are fresh (as they are made fresh daily) and full of flavour and crunch thanks to the inclusion of traditional Asian herbs. My favourite out of the two was the Salt & Pepper tofu roll which had some added spice thanks to the use of Kim Chi sprouts. These rolls are quite generously sized and I had enough for dinner time as well! The second time around we booked a table for 12pm and were seated inside. The atmosphere is buzzing and does make you feel like you are in downtown Vietnam in the markets. As I can only eat Halal meats the lunch special option was out for me so I decided to order the Silken Tofu Vermicelli Noodles – with wok tossed fried silken tofu and vegetarian spring rolls. I did ask the waitress if she could change these vegetarian spring rolls to the imperial spring rolls (which had crab & prawn inside them) however she said this couldn’t be done. I ordered a Kumquat Lemonade drink which was refreshing. I really loved the flavour combination of kumquat and lemonade and had to stop myself from finishing the drink all in one go. A ordered the Coconut Crush which was just as good and had fresh pieces of coconut through the drink. The Silken Tofu Vermicelli Noodles comes out presented beautifully – the salt and pepper crusted tofu sitting on top like soft pillows amongst the colourful greens, Kim Chi sprouts and spring rolls all served in a blue and white bowl, with the Vermicelli hidden underneath. There is sweet soy sauce on top in a separate dish as well. Just from the look of the dish I can barely contain myself to take picture of the dish without wanting to tuck into it. I pour the sauce throughout the dish and take my first mouthful and am not disappointed. It was fantastically delicious! The crunchy outside of the tofu together with the soft silkiness inside along with the coriander, herbs and spicy crunch of the sprouts was a match made in heaven. I literally devoured the entire dish. The vegetarian spring rolls were full of flavour and added depth to the dish as well. Around the table everyone was talking about how good the food was. J got the Lunch Special A and said the Beef Pho was delicious – with the quality of the beef being top notch together with a tasty broth and quality noodles. He also commented on the Banh Mi being flavoursome with the bread being crunchy and fresh. I got a chance to sample the Imperial Rolls which have a delicate netting on the outside which I loved the look of. The rolls were superb – with a great texture of crunch on the outside and soft flavoursome prawn and crab meat on the inside. These rolls are a definite must order for anyone and everyone. Service is great with staff friendly and always happy to assist if you need anything. Banoi also has a strong focus on good coffee – they work with Campos coffee – and use a La Marzocco machine to pump out smooth tasting and full flavoured cups. Banoi is all about Vietnamese food and Vietnamese food done well – the ever growing queues and crowds at lunchtime and dinnertime are testament to this. The trek down to Docklands is definitely worth it. Atmosphere / Ambience: Casual, Laid Back, Funky. Has a market like feel to it that reminds you of the Saigon Market in Vietnam. It is great for a casual meal and catch up drinks. A and I were due for our regular dinner catch up and she suggested we check out Mr Big Stuff. We tried to book a table but due to its newness & popularity there were no tables available, however they did inform us that if we came in we could sit at the bar – so this is what we did. 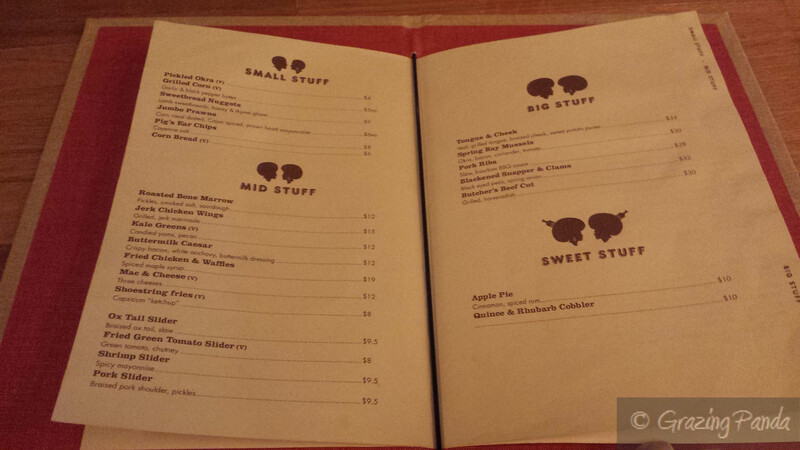 Mr Big Stuff is the new, funky and soul filled restaurant that’s taking Melbourne by storm. It is located in Meyers Place (it resides where Senorita used to be) – pretty much in and around the centre of the Melbourne CBD. Mr Big Stuff is relatively new having only been open a few months (opened in May 2014) with the concept being to add a bit of soul into the Melbourne food scene – and adding soul they do! From the moment you step inside you feel like you have been transported to 70s – from the pumping soul music to the orange and red warm tones and completed by the swagger of the wait staff in cute retro diner attire – think suspenders and bow ties. You can thank the 5 partners, including Michael Chen and Adam Ong from Golden Monkey bar (located in Hardware Lane) together with Head Chef is Louis Naepels (ex-Grossi Florentino) for bringing this new style of venue to Melbourne. Mr Big Stuff is all about sharing some great tasting soul food and bopping along to some really great music. The venue has a in-house turntable that plays Thursday to Saturday (the night starts out with soul music, then progresses to R’n’B and cranks up to Hip-Hop – pure awesomeness!) and is decked out with sound-proofing material on its walls. Mr Big Stuff has been designed by Techne architects and has wooden tables along with some banquet seating in the main dining area. The other main feature is the wooden bar and the hole in the wall which allows you to peer into the kitchen. The tones of orange, red and wood really make you feel like you have stepped into the 70s and get you prepared for the food adventure that is about to begin. What I loved when I looked up the menu online was the drinks menu and the fact that you could have each and every traditional beverage sans alcohol. This was fantastic for me as I don’t drink! You can choose from the Cold Pressed Kool-Aid drinks – there are 4 different flavours to choose from, or the Egg Cream – a New York-style spider, which interestingly is egg free – Homemade Chocolate Sauce, Milk/Cream & Soda is the flavour available here. There is also a selection of Cold Brew Ice Teas available – of which there are 5 to choose from. There is a magnitude of choices to select from so it took me a while to decide what I wanted – if I had it my way I would have spent the entire night there sampling every drink! I decided to go with the Kickin’ Kiwi – Cold Pressed Kiwi Juice, Fresh Lemon Juice & Soda. The Kickin Kiwi was full of flavour, refreshing and hit the spot. The tangy flavouring of the cold pressed kiwi worked well with the lemon and soda, that had this effect of creating a party with every sip. A ordered the P.Y Tea – Cold Brew Hibiscus Tea, Fresh Cold Pressed Watermelon & Fresh Lemonade. A’s drink came out served in a tall glass and came with extra sugar syrup on the side in case she wanted to make it sweeter – which she did utilise as it was a tad bit bitter at the start. I sampled her drink and it was quite tasty and refreshing as well – with the hibiscus tea flavouring much stronger than the watermelon. An all round good drink! The menu is designed and created by Louis Naepels and is broken into four sections – Small Stuff, Mid Stuff, Big Stuff and Sweet Stuff. Naepels has done great things with menu especially coming from cooking Italian at Grossi Florentino – it is adventurous, fun and mixes brilliant flavours together. Across each of these sections there are upwards of 5 different dishes to try, except for the Sweet Stuff – there are only 2 desserts for now to try. Small Stuff includes dishes such as Pickled Okra, Grilled Corn, Pig’s Ears and their famous Corn Bread. Mid Stuff includes a selection of sliders (there are 4 different ones to choose from), and dishes such as Mac & Cheese, Kale Greens, Chicken Wings and Roasted Bone Marrow. The Big Stuff consists of Blackened Snapper & Clams, Mussels, Veal, Beef and Pork Ribs. 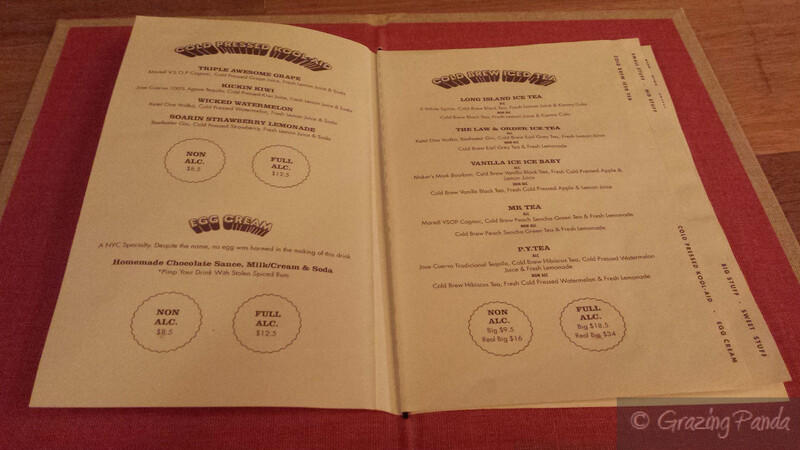 We were told by the friendly waitress that the menu was created to be shared – ordering a little bit from each section. We decided to share some things and order some separate dishes for the each of us as well (this tends to be what happens when A & I go out as I am a pescatarian and she can eat everything). One of the first dishes to come out was the Jumbo Prawns – Corn Meal Dusted, Cajun Spiced, Prawn Head Mayonnaise –you get one prawn per serving. The prawn came out looking deliciously crunchy and it sure didn’t disappoint! The Cajun spice mixed with the soft texture of the well-cooked prawn was scrumptious – pair that with the “prawn head” mayonnaise and you have a somewhat fiery hit mixed together with a creamy finish. You really could eat more than a handful of these at a time. A ordered the Sweetbread Nuggets – Lamb Sweetbreads, Honey & Thyme Glaze. Initially she was a bit apprehensive to order this dish – but speaking to our waitress she reassured her that it was a great dish, and it just tasted like lamb. These came out in a serving of five and looked exactly like how you would imagine nuggets to look like – served in a turquoise blue bowl and topped with thyme sprigs. A really enjoyed this dish and mentioned more than once how good these nuggets were – crispy coating on the outside and soft, tender lamb on the inside with a sweet aftertaste to finish on. I also couldn’t look past ordering a slider from the menu and went with the Shrimp Slider with Spicy Mayonnaise. Once again this was another stand out dish – the shrimp had been fried to provide a crunchy texture and together with the slight sweetness of the brioche and the spice of the mayonnaise were a great combination. There are no words to describe it – you just have to try it yourself! A ordered the Fried Chicken & Waffles – Spiced Maple Syrup – which seemed like one of the more popular dishes on the menu to order. I mean it is quintessentially soul food after all! This is quite a generous dish and comes with couple of pieces of chicken off to one sized, with perfectly placed waffles on the other, with the spiced maple syrup in a separate mini pitcher. The chicken has been marinated overnight in buttermilk and a spice blend of black pepper, cloves and cayenne pepper. The result was that the batter was flaky, crunch and fell off the chicken in a way that you would want it to. The chicken was cooked to perfection – juicy whilst being tender- and had combined hints of smokiness, spiciness and sweetness. The rosemary and cheddar flaked waffles were out of this world – crunchy and textured on the outside whilst being soft and fluffy on the inside. The combination of the savoury waffles with the sweetness of the spiced maple was interesting and must be experienced. We also ordered the Mac & Cheese – Three Cheeses – to share. This dish comes served hot hot hot on a warm pan and from the moment it is placed down you get the wonderful aroma of the cheese. The top layer is a combination of the three cheeses and crumbed biroche which have been toasted just right. The cheesy creamy pasta of elbows had a great peppery taste to it – combine this with the crunchy breadcrumbs and this dish is heaven. For usual Mac & Cheese lovers – you wouldn’t want to share this dish! What is also brilliant about Mr Big Stuff is that they make their own Hot Stuff Chilli sauce which is bottled and is made from Habanero Chillies, Cayenne, Carrot, Apple Cider Vinegar and Spices. This sauce sure does pack a bit of a punch and is great for all of you who want that extra hint of chilli in your dishes .This also works well with the Shoestring fries! Despite being full we had to check out dessert – if the food was anything to go by then the desserts would be just as amazing. I ordered the Quince & Rhubarb Cobbler. Initially I wasn’t quite sure what a cobbler was so had to ask our friendly waitress. A cobbler usually consists of a fruit or savoury filling which is then put into a baking dish and covered with a batter, biscuit, or pie crust before being baked – hence creating a combination of crunch and softness. Generally speaking I’m a sucker for anything with Crème Fraiche – I think it adds a great element and depth to a dish and brings out flavours even more. The cobbler was quite a refreshing dish – with a combination of star anise and fruity flavours. The “cake” bits were moist, soft and delicious with the bread crumbs providing another texture. You definitely needed the addition of the Crème Fraiche to add some creaminess and extra wetness to the dish. Overall a very different yet tasty dessert. A ordered the Apple Pie – Cinnamon, Spiced Rum. This wasn’t like any apple pie you would normally order – they came out as individual little pockets which reminded me of mini pastries – you get 4 per serve. The pastry on the outside was buttery, flaky and had a great flavouring to it, coated with cinnamon sugar. The inside was filled with a smooth warm apple filling that was both juicy and tasty. A said she really liked this different take on the apple pie. The staff here are really friendly and always ensure you feel looked after without being overbearing. They are happy to offer suggestions when you are ordering food and can assist in answering questions. Another stand out of the venue is the music – we both loved the music played – it brought back memories from our high school days with stand outs like MJ, TLC just to name a few. If the music was this good when the in-house DJ wasn’t playing I can’t wait to come and check out the DJ sets on Thursday to Saturday nights. When we call for the bill – it arrives in a wallet with Mr Big Stuff engraved on the front – which I think is quite fun and fits in really well with the 7os theme. They also have a variety of uniquely designed coasters which use known brand logos such as Pringles, MTV but change it to reference the Mr Big Stuff name. Creative! Mr Big Stuff is a Soul Food inspired restaurant designed around sharing great tasting food with friends along with unique Kool-aid drinks and funky tunes in a lively and warm atmosphere. If you want to be transported to the 70s and try out a place that makes you feel like you are part of the Soul Train set – this is your place! Atmosphere / Ambience: Funky, Soulful, Warm and Inviting – a great place for a celebration and an all round good time! They have in-house turntables which place on Thursday to Saturday nights. A Lunch Service is COMING SOON!